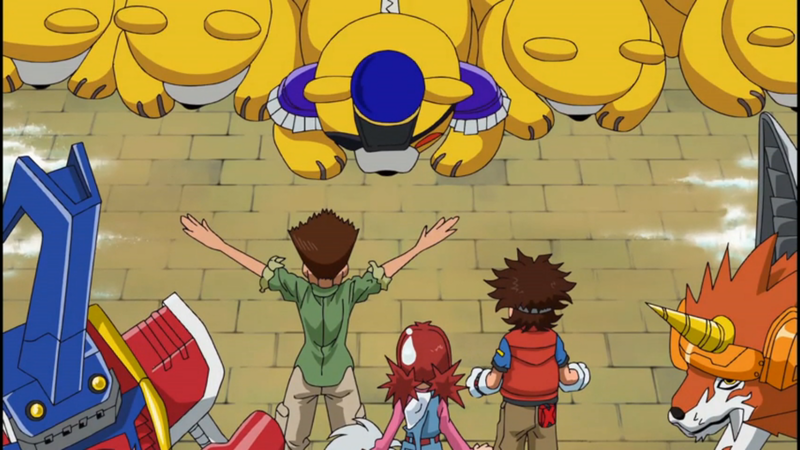 Digimon: System Restore: Fusion Episode 27: Sweets Zone Bake-off! Let's start off with this- you have to admire a spot-on Iron Chef parody. The setting for the big showdown between challenger Angie and Iron Chef WaruMonzaemon hit all the right notes. The overplayed drama and showmanship, the awe-inspiring Kitchen Stadium, the strict one-hour time limit... they even worked the bell pepper in there! Straight-up parody doesn't happen every day in Digimon, even rarer when it's able to cross oceans so fluently. So let's take a moment to stop and appreciate such a fun homage, because the last time an episode was this bad the Frontier kids were trying to beat the Royal Knights with snowballs. If this episode had happened early on in the series, it might be a little more tolerable. It still wouldn't be any good, but at least we could shrug it off and forget about it. There are only four episodes left in this first arc of Fusion. It's inexplicable that one of them could be burned on something so trivial. It feels like it comes straight off the “nothing else is going on; let's give Angie some attention” pile. Between the Bagra Army losing one of its generals, Damemon working for AxeKnightmon and the Fusion Fighters now leading the code crown race, there's plenty going on. Yet nobody seems all that interested in any of this. Even Tactimon, who now considers Mikey a serious threat, would just assume let the local army handle its business before intervening. That's how little got done. Don't confuse “paying attention to Angie” with giving her any character development, or even credit of any kind. 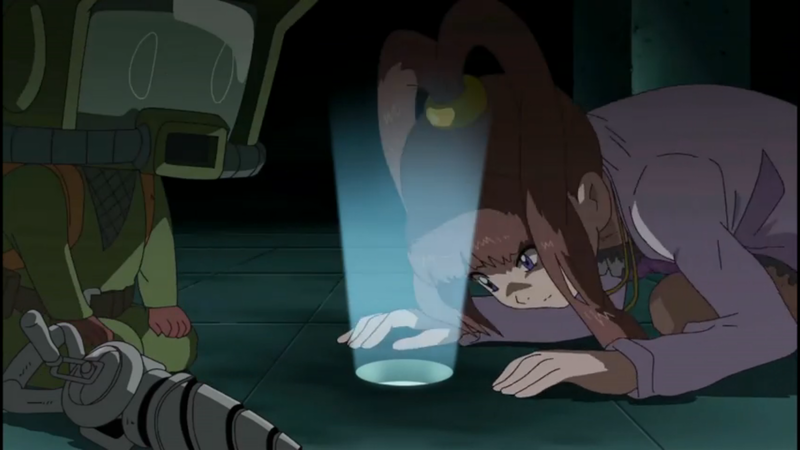 Matadormon already has the code crown by the time they enter (it's shocking that this is the first time the bad guys actually found it in advance), and Mikey learns that the only way they can even see him is to cook something awesome for him. He nominates Angie for the job, again possibly believing that this is the only sort of thing she's good at. You know, for a couple episodes there he was starting to treat her like a person. As it would turn out, actually being a functional cook was not necessary to enter Kitchen Stadium and ultimately meet (and fight) Matadormon. They just had to say Angie was and they were in; Matadormon revealed himself as the judge either way (behind a screen, but it's not like it was bulletproof). That would have been nice to know, since the entire episode's drama seemed to hinge on them needing to win this competition. Granted, that should have been impossible given the opponent's expertise, Angie's lack of experience and Shoutmon and Ballistamon being gullible gluttons. That she actually won feels almost like an insult. I've seen enough Food Network to know presentation counts in this sort of thing. To go Gordon Ramsay on you, THAT LOOKED SO UNLIKE PIE IT WAS ROUNDED TO THREE. Even more amazing, while the main group is playing kitchen, Nene is very quietly doing all of the work. That's an even bigger injustice. It's even a subtle role reversal. Rather than prioritizing saving the local chefs, Mikey goes directly for the code crown. That's not his fault (he's merely carrying out the original plan to get inside and the Monitamon said they'd take care of the rest), but it is a different look. At least it would be if we got more than a couple token shots of Nene actually getting the job done. The silly baking challenge is little more than a diversion, yet it dominates the time and any effort at suspense. All the while Nene's the real hero, but pulls off her mission easily and with no drama. The “crying for help and barely phasing through” bit hasn't been used since the first episode, and this is where they pull it out? It's a bit arbitrary since Spadamon is mostly a non-factor until the very end of the episode. The Bagra Army has a pretty clear objective of collecting all the code crowns and reshaping the world to their own devices. You have to question the logic of getting the crown and abusing it by locking up locals and forcing them to cook for the zone's puppet governor. That's just begging for an uprising and there's no reason to bother risking it. Mr. Kudo and Miss Hinomoto are surprised to see Japanese lettering as if it was somehow exotic. That's worth a shudder, but don't forget that Adventure called hiragana digicode before it became impossible to hide the fact that the kids were from Tokyo. All the same- silly dub. At the same time, Jeremy claims that his kendo expertise means he can read kanji (and he actually calls it kanji! ), even as he's the only character whose last name was changed in the dub. Is it possible for a Japanese native to also be a weeaboo? So Angie has next to zero experience cooking, but she can recall all the ingredients and mixing instructions for a banana cream pie? That's an awfully gigantic mixing bowl they're being forced to use to make a normal-sized pie. So, this season finally got a D grade. I was beginning to wonder if it would join Data Squad in not receiving a single one. It couldn't have happened to a more deserving episode, though. I remember cringing with embarrassment when I sat through this. It feels like they wanted to lighten things up between two serious episodes, and mistook that for jumping into a completely unrelated genre for the dumbest of reasons.